[PDF] Kinetic Theory and Transport Phenomena (Oxford Master Series in Physics) | Free eBooks Download - EBOOKEE! Description: One of the questions about which humanity has often wondered is the arrow of time. Why does temporal evolution seem irreversible? That is, we often see objects break into pieces, but we never see them reconstitute spontaneously. This observation was first put into scientific terms by the so-called second law of thermodynamics: entropy never decreases. However, this law does not explain the origin of irreversibly it only quantifies it. Kinetic theory gives a consistent explanation of irreversibility based on a statistical description of the motion of electrons, atoms, and molecules. The concepts of kinetic theory have been applied to innumerable situations including electronics, the production of particles in the early universe, the dynamics of astrophysical plasmas, quantum gases or the motion of small microorganisms in water, with excellent quantitative agreement. This book presents the fundamentals of kinetic theory, considering classical paradigmatic examples as well as modern applications. It covers the most important systems where kinetic theory is applied, explaining their major features. 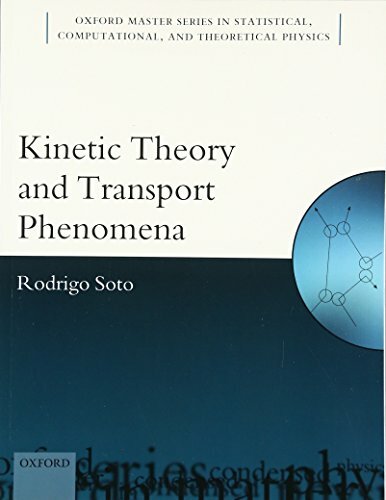 The text is balanced between exploring the fundamental concepts of kinetic theory (irreversibility, transport processes, separation of time scales, conservations, coarse graining, distribution functions, etc.) and the results and predictions of the theory, where the relevant properties of different systems are computed. No comments for "[PDF] Kinetic Theory and Transport Phenomena (Oxford Master Series in Physics)".